CALL BOB MCDONELL AND TELL HIM TO VETO THE TAX HIKE (SO CALLED TRANSPORTATION) BILL! The largest tax increase in the history of Virginia was just passed by our Virginia legislators. Republican Speaker Bill Howell and Senate Majority Leader Tommy Norment (R) engineered a six billion tax increase on Virginians, in very tough economic times. The taxes were so outrageous, that the Republican Leadership needed the support of Democrats to pass it, even though Republicans have an overwhelming majority in the House and tied representation in the Senate. You will see new taxes or increase in taxes on all of the following: sales tax, gas tax, diesel fuel tax, vending machine tax, personal property tax, hotel tax, internet tax, car tax, tangible property sale tax, and more! 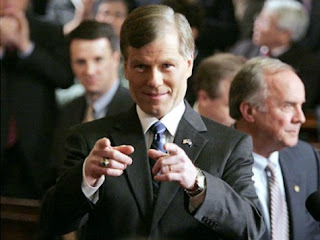 Governor Bob McDonnell aggressively pushed and expressed support for this $6 billion tax increase plan. Bob wanted the tax increase so bad that he even made a deal with the Democrats to get the votes he needed by pledging to pave the way to implement Obamacare's Medicaid expansion, which will add an additional 400,000+ people to the Medicaid roles in Virginia. But it is not too late! The bill is sitting on Governor Bob McDonnell's desk. Join here and tell Bob that you stand with other Virginians who oppose implementing the largest tax increase in the history of Virginia on the hardworking poor and middle class, especially during this bruising recession. Tell Governor Bob McDonnell to veto the largest tax increase in the history of Virginia - HB2313.